We prefer payments to be made via Paypal. Please email us for payment or any other sales-related queries. If you have difficulty obtaining any Sombrero Books title via your favorite bookstore or online retailer, please contact us. Author, playwright and flying ace Elliot William Chess was in his late-forties when he spent several months in Ajijic at the small hotel Casa Heuer in 1946, but had already experienced far more than most people can manage in twice as many years. Born in El Paso, Texas, at the turn of the century, Chess left El Paso High School when the first world war broke out and emigrated to Toronto, Canada, to enlist in the Royal Flying Corps. His RFC papers give his birth date as 25 Oct 1898, though it is entirely possible that the teenage Chess inflated his age by a year or two to boost his chances of acceptance. He served overseas from age 18. After the end of the war (1918) he was the youngest American pilot to join the Kosciusko Squadron in Poland. He fought with them for two years in the Polish-Soviet War (1919-21), for which he was awarded the Virtuti Militari, Poland’s highest military award. In the Second World War the “Kosciuszko” Polish Fighter Squadron No. 303 was the highest scoring of all RAF squadrons in the Battle of Britain. Captain Elliot Chess, who served in WWII in the “A” Troop Carrier Group of the Ninth Air Force, was presented with his “Polish Pilot’s Wings” at a special ceremony in June 1944. Chess had fulfilled a childhood dream by becoming a published writer. He wrote numerous short stories and novelettes, published between 1929 and 1932, in magazines such as Sky Birds, Sky Riders, Aces, War Birds, War Aces, Flying Aces and Air Stories. He also worked for Liberty magazine. In 1941, his first and only novel, Walk Away From ‘Em, was published by Coward-McCann. Nick Wayne, the hero of his novel is (no real surprise here!) a transatlantic pilot, who “tangles with three women – his ex-wife, Jo, a neurotic dipsomaniac, Fran, and Toddy Fate, young and untouched”. (Kirkus Review, which summarized it as “pop stuff” but “better than usual of its kind”). The Elliot Chess papers, in the C.L. Sonnichsen Special Collections Department of The University of Texas at El Paso Library, include drafts of two plays, Passport to Heaven, and Call it Comic Strip, as well as notes, photographs and other material. It is unclear why Chess chose to spend the latter part of 1946 in Ajijic, but his sojourn there had several unexpected consequences. Already in residence at Casa Heuer (a small, rather primitive guest house on the lakefront run by a German brother and sister) was an attractive, more serious, younger writer, Elaine Gottlieb. Despite their sixteen-year difference in age and their contrasting backgrounds (or maybe because of them? ), the two hit it off almost immediately, with Gottlieb spellbound by Chess’s magnetism and captivating story-telling. According to Gottlieb, they lived together as man and wife for two months, from mid-September (when they were on a bus to Guadalajara that was attacked by gunmen) to mid-November, at which point Elliot Chess returned to El Paso, claiming he would sell some land he owned there and rejoin her in New York in two weeks. Gottlieb, meanwhile, traveled by train to Mexico City and then to New York. Chess never made it to New York, and the two never met again, but Gottlieb gave birth to their daughter, Nola Elian Chess, in New York City on 3 July 1947. (Nola’s middle name is a combination of Elliot and Elaine). We can only speculate as to whether Elliot Chess’s aversion to moving to New York was in any way connected to his prior marriage there in 1930 to a “Jean B. Wallace”. It is equally plausible that Chess had no desire to be a father, having never known his own father. Chess died in El Paso, Texas, on 27 December 1962, at the age of 63, but left no will. When his aunt claimed to be the sole beneficiary, Elaine Gottlieb sought to establish that her daughter (whose birth certificate listed Elliot Chess as father) was entitled to a share of his estate. The case hinged on whether or not Nola was Chess’s legitimate child. Had Gottleb and Chess ever celebrated a legal marriage? In documents filed with the court, Gottlieb claimed that she believed they had been legally married, though she had no marriage certificate. The somewhat convoluted story is retold by Robin Hemley in Nola: A Memoir of Faith, Art, and Madness. Gottlieb, who by then had married Cecil Hemley, failed to convince the court which concluded, even after an appeal in 1967, that Nola had no right whatsoever to any part of her father’s estate. “I married Elliot Chess September 15, 1946, in Ajijic, Mexico, and lived with him until on or about November 16, 1946. Elliot did not make an application for a marriage license in the Republic of Mexico. I have no written evidence that I was married to Elliot. It wasn’t that kind of marriage. I said to him, ‘I take the Elliot to be my lawful wedded husband’ and he said to me, ‘I take Elaine to be my lawful wedded wife.’ I did not sign a civil registry of our marriage in the Republic of Mexico. Neither Elliot nor I appeared before any public official, by proxy or otherwise, to be married. On November 17th I boarded a train for Mexico City. Elliot kissed me goodbye at the hotel early that morning and that was the last time I saw him. I returned to New York and the appellant was born on July 3rd, 1947. Elliot Chess is the father of Nola Elian Chess.” (Court of Civil Appeals of Texas, Eastland.416 S.W.2d 492 (Tex. Civ. App. 1967) BUNTING V. CHESS). Robin Hemley’s Nola: A Memoir of Faith, Art, and Madness is a detailed account of his older, and brilliant, step-sister Nola’s life and descent into schizophrenia, and how it affected the entire family, including Elaine Gottlieb. It is an uplifting, if at times harrowing, read. Three Bad Nights introduces a Mexican detective, Don Pancho (short for “Francisco de Torla Saavedra, Marqués de Langurén y Orandaín”), an eccentric, laid-back, huarache-wearing former federal detective who, with his manservant sidekick Crisanto, solves jewel thefts, murders and other glamorous international crimes. The setting of Three Bad Nights is the fictional Quinta de las Rosas hotel on the shores of the equally fictional Lake Zirapan. While there are insufficient clues to claim that this is anything other than an invented locale, the authors were extremely familiar with the Lake Chapala region of western Mexico, and the Posada Ajijic hotel in Ajijic. Since the book refers to Don Pancho’s “big hacienda in Jalisco” named La Chavinda Paz, it seems likely that the authors intended readers to infer that Lake Zirapan was somewhere in the same state. Lady Kendon, an English aristocrat, long separated from her philandering husband, who is accompanied by her two Aberdeen terriers, Scotch and Soda. Colonel Rawlins who is due to meet his wife and daughters in Chicago within a few days, and who behaves more drunk that he really is at a hotel party. Carlotta, “a beautiful Buenos Aires belle”, with valuable jewels to match, traveling with her “brother” Valentino. Leslie King, a young American, who considers himself Isobel’s boyfriend, turns up part-way through the action. Within a few pages, the first body is found. It turns out to be the hotel nightwatchman Rosario, whose body has been hidden in the reeds at the edge of the lake. The next morning, following a party that roared into the early hours, a second body is found. This time it is Carlotta, whose jewellery box has been broken into. The food-loving Inspector Tovar (aka El Capitano) arrives from the big city to take charge of the investigation. As he, Don Pancho and Crisanto begin to investigate, they quickly find that everyone has something to hide. The following day, the body of Mrs. Singer turns up in the lakeshore reeds. Slowly, patiently and methodically, Don Pancho manages to piece together what really happened, and who is responsible. In Three Bad Nights, the local mayor refers to the “twenty-eight United States of the Republic of Mexico” (Penguin edition, page 47). Assuming that the mayor kept up with the times, this dates the events in the book to sometime prior to January 16, 1952 when Baja California became the 29th state in Mexico. Charles Fleming Embree was born in Princeton, Indiana, October 1, 1874, the son of lawyer David Franklin Embree, member of a prominent pioneer family, and Mary Fleming Embree. Charles was still an infant when his father died in 1877. To this day, one of the main streets in Princeton is N. Embree Street, and the Fire Department Chief at the fire hall (on Embree and W. Brumfield) has the surname Embree. Charles Embree was educated in Princeton public schools and entered Wabash College in the fall of 1892. After three years he left college without graduating to devote himself to writing, and achieved immediate success. For the Love of Tonita, and other tales of the Mesas was his first book, published in 1897. The success of his first book led to two more novels. On January 18, 1898, he married Virginia Broadwell. The young couple moved to Mexico, and lived in Chapala for eight months in 1898, before moving to Oaxaca. The precise motives behind Embree’s decision to spend two years in Mexico remain frustratingly unclear. Embree’s second book, dedicated to his wife, is set in the Lake Chapala region, but was written while they were in Oaxaca. A Dream of a Throne, the Story of a Mexican Revolt (1900), is illustrated with five black and white drawings by Henry Sandham (1842-1910), a very well-known Canadian illustrator of the time. From Oaxaca, Embree also penned a short newspaper piece about anthropologist Frederick Starr, who was conducting fieldwork there. Embree’s third book, illustrated by Dan Smith, was A Heart of Flame: the Story of a Master Passion (1901). Embree also had several short stories published in McClure’s Magazine, from 1902 to (posthumously) 1906. In recognition of the distinguished place he had already achieved among American novelists, Embree was awarded an honorary Master of Arts degree by Wabash College in 1903. Embree and his wife moved to Santa Ana, California. Sadly, the couple had not long celebrated the birth of their only daughter Elinor in 1905 when Embree was taken seriously ill. He died on July 3, not yet 31 years old. 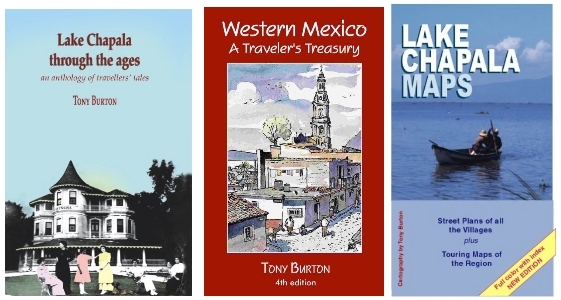 A short extract from Embree’s “A Dream of a Throne” is included in Tony Burton’s “Lake Chapala Through the Ages, an anthology of travellers’ tales” (Sombrero Books 2008). This book has extracts from more than 50 original sources covering the period 1530-1910, together with short biographies of the writers, and an informative commentary setting the extracts in their historical context.